During his Antarctic expeditions, Shackleton left a volcanic legacy by overseeing the first exploration of Mount Erebus. But in his reports he notes an indication of another volcano, one which has never been identified. In this post I propose the first identification of this mystery volcano. Each their own. The three most famous explorers of Antarctica are Amundsen, Scott, and Shackleton. Amundsen the victor: the first person to reach the South Pole and return in safety. Scott the tragic hero: the first person to reach the South Pole and not return. And Shackleton, failing to reach the South Pole on three different attempts, but returning safely against impossible odds. On his first attempt, in 1902 with Scott and Wilson, he reached 82 degrees south. The second time, in 1908, he came very close, at 88 degrees south, a little over 100 miles from the Pole. On this expedition, Antarctica’s most active volcano, Mount Erebus, was climbed for the first time. On his third attempt, he never even set foot on the continent, and lost his ship in the pack ice. But this failure became his most inspirational journey. Sir Ernest Shackleton’s third expedition left England Aug 1, 1914, within hours of the outbreak of the first world war. The aim of the expedition was to land along the Weddell Sea and to march across Antarctica via the South Pole to the Ross Sea. 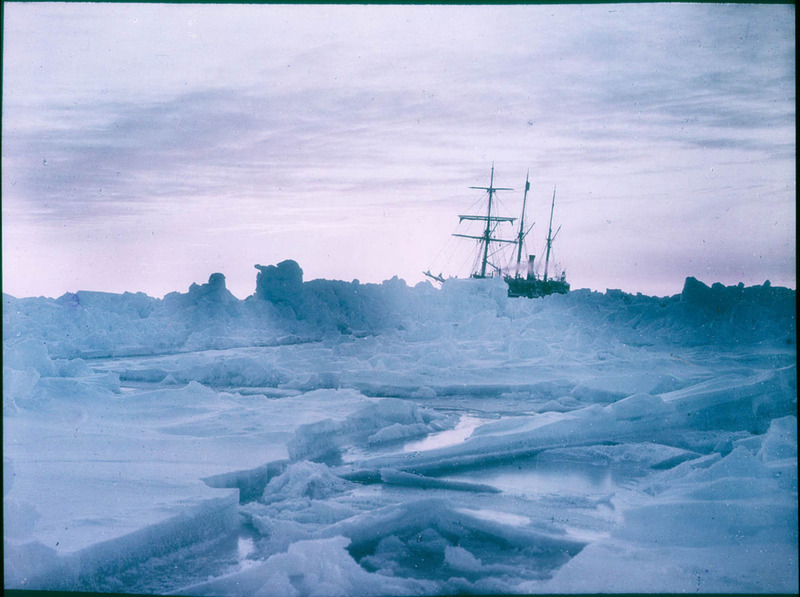 After a stop-over in South Georgia, Shackleton managed to reach the Weddell Sea, but the sea ice was far heavier than expected and he failed to find a way through. We now know that the south-east part of the Weddell Sea collects a mass of ice every 3-4 years, as it gyrates clockwise around the sea: Shackleton happened to hit one of those years. After discarding a promising landing site, his ship the Endurance became stuck in February 1915 and froze into the sea ice. Many months of drifting with the ice pack followed. A BBC article shows photographs of this time, bringing the characters vividly to life. On October 27 the ship finally succumbed to the pressure and was crushed; the wreckage sank on November 21. Shackleton and his crew set up camp on the ice. Only three small lifeboats were left. The camp drifted north with the sea ice, which by March had become so thin that one person started to feel sea sick from the swell. On April 9, 1916, the ice finally broke up. 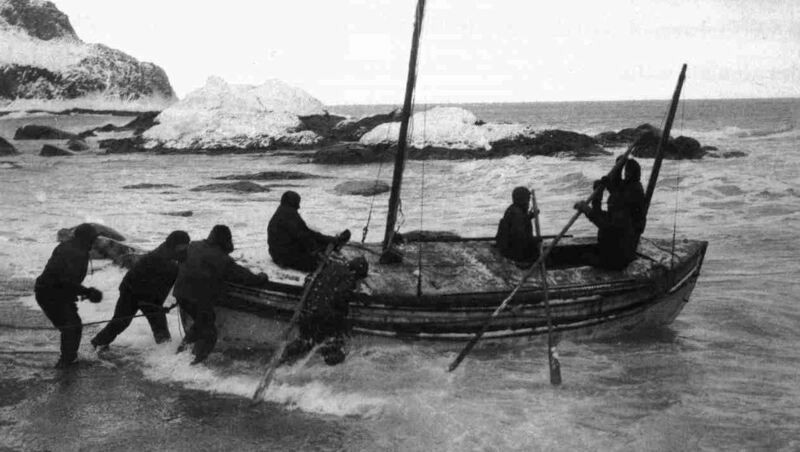 The ship-wrecked crew managed to launch the small boats just before the ice disintegrated. Neither the small boats nor their crew could handle the swell of the open ocean: the soaked man were suffering from hypothermia and frostbite. But hiding between the ice floes was equally dangerous. After a week of this, near death, they managed to reach Elephant Island, a desolate and unforgiving place without food or shelter. Shackleton and four companions left to get help, in one of the greatest sea crossings ever recorded. In a small lifeboat with a flimsy covering, they covered 800 miles to South Georgia, across the most tempestal ocean on Earth, at the end losing their mast in a hurricane which (unbeknown to them) sank a large ship nearby. Their navigation, based on four difficult sextant measurements during the two week journey, is legendary. Out of fresh water and without mast, by necessity they landed on the wrong side of South Georgia. Waiting for a full moon, three man managed to cross South Georgia on foot, a feat never achieved before. This journey over unexplored and unmapped mountain ranges took 36 sleepless hours, during which they almost froze to death. Shackleton and his two companions finally reached the Norwegian Stromness whaling camp, just before a snow storm started which they could not have survived in the open. The first people to see the three ruffians ran away in fear! It took four more months before the crew members on Elephant Island could be rescued by the Chilean navy, on the day their food supplies ran out. Amazingly, everyone survived. In a world racked by war and desperate for good news, this story of impossible survival went viral. Shackleton overcame disaster, mutiny, and anything the Antarctic threw at him, while keeping his man (including a young stow-away) safe. A world at war badly needed such an image. The lifeboat ‘James Caird’ leaving on its journey for South Georgia. The boat is still on display in London. Shackleton’s book about the ‘worst journey in the world’, simply called ‘South’, is a gripping read. It leaves out some less convenient details, such as the stow-away and the mutiny, but exudes a sense of optimism in every situation. It also contains a wealth of scientific observations, regarding the weather, the ice, and even the first recording of an oceanic super-wave during the desperate race to South Georgia. This happened on Jan 2, 1915, before the Endurance had become stuck. The location was near 69o 49′ South, 15o 42′ West. The description of the yellow-brown band sounds very much like a volcanic deposit, as Shackleton identified them. Such layers are fairly common in icebergs around Iceland (albeit mainly black rather than yellow.) The dark basaltic earth may have come from the same eruption, perhaps dropped on the floe by a disintegrating iceberg, but it may be unrelated. Ash does not travel very far and the iceberg must have been fairly close to the erupting volcano. The fact that the yellow-brown band was within an iceberg suggests that the iceberg had not yet become a traveler but was still growing at the time of the eruption. Most likely it was part of one of the many Weddell Sea ice shelves. An ice shelf is a floating or grounded extension of a land glacier, which remains in place year round, and can be many hundreds of meters thick. The broadness of the volcanic band may mean that the eruption lasted some time, but also indicates that there was limited compression by the weight of snow from later years. The eruption could have been some years or decades before the iceberg calved, but probably not centuries or the band would have become thin layers of ice. The Weddell sea is known for its gyre. Ice moves around with the ocean currents in a great circle, following the coast east to west, bending north, and returning west to east. The iceberg could have formed somewhere along this gyre. The drift of the Endurance also followed the gyre. If an iceberg fails to escape, the gyre will return it to the Antarctic coast east of the Weddell Sea where it will go round once more. The Weddell Sea gyre. The current and sea ice goes round clock-wise. There are many volcanoes in the region, mainly along an arc stretching from the sub-Antarctic South Sandwich Islands to the Antarctic Peninsula. 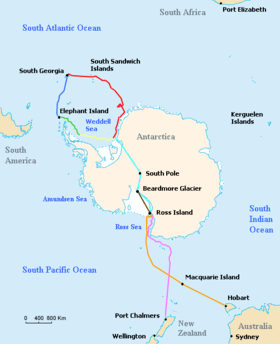 A list of Antarctic volcanoes, and a separate list of those of the South Sandwich island, is available on wikipedia. But which of these could have been Shackleton’s culprit? Volcanic activity is poorly recorded in this area, where few people are present at the best of times (and none outside of the summer season) and the weather is often far from ideal for eruption viewing. Still, it seems that there are a number of highly active volcanoes in the area, vying with the frequently erupting Mount Erebus on the other side of Antarctica. Mount Michael on the South Sandwich islands erupted during 2015. Which volcano could have caused Shackleton’s yellow ice band? Can we solve this mystery of the lost volcano? Even if Shackleton failed to reach the hidden continent, the discovery of volcanic activity could still return a scientific success. One possibility is the most active volcano in the region, Deception Island, with documented eruptions in 1842 and 1906, and suggestions of further, undetected eruptions in between. Deception Island has had a massive caldera-forming eruption in the distant past, but recent eruptions have been small, with eruption volumes around 0.05 cubic kilometer. It is located on the other (western) side of the Antarctic peninsula. The prevailing wind over the peninsula is westerly, which is in the right direction to carry the ejecta across the peninsula to the Weddell Sea. The largest ice sheet there is the Larsen C Ice Shelf, but at 300 kilometer distance it seems much too far and it is in the wrong direction for significant deposits. Further north are three smaller ice shelfs: Larsen B, Larsen A and Prince Gustav, where the latter two may have been connected in Shackleton’s time. The Larsen A and Prince Gustaf ice shelfs disintegrated in 1995 and no longer exist, early victims of the current warming in the region: the Antarctic Peninsula has warmed by 2.5C since 1950, possibly the fastest rate on Earth. 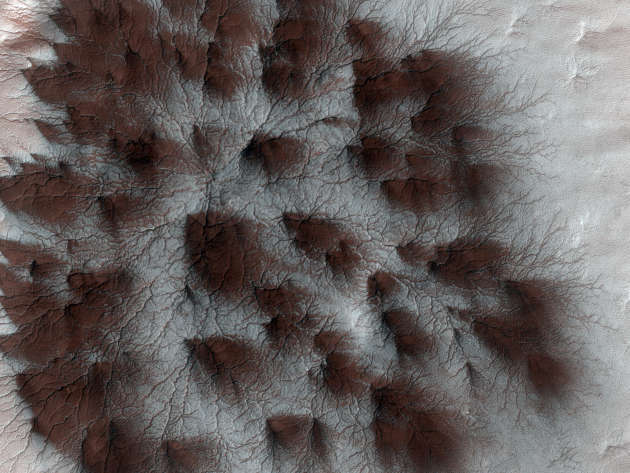 Larsen B partially collapsed in 2002 and is expected to be completely gone by 2020. Larsen A/Prince Gustav was a small, fast moving ice sheet before its collapse and is a plausible candidate for Shackleton’s iceberg. Prince Gustav is less than 100 kilometer SSE from Deception Island but this is still rather far for deposits from a smallish eruption. The Antarctic Peninsula. Deception Island is indicated by ‘DI’. PGC is the Prince Gustav, L_A and L_B are Larsen A and B, which all used to be significant ice shelfs. Larsen B is due south of Deception Island. There are also volcanoes on the Weddell Sea side, which are located much closer to the Prince Gustav shelf. The closest is James Ross Island, next to the ice shelf, which contains a large shield volcano, but no historic eruptions have been recorded. The Seal Nunataks are a group of 16 small islands of which Robertson Island is by far the largest, located within the historic area of the Larsen A shelf. 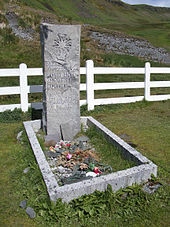 They were discovered by Captain Carl Larsen, a Norwegian whaler, on December 11, 1893, and at that time it was noted that Lindenburg Island and possibly Christensen island were in a state of eruption. Lindenberg was said to have a black ash flow, and Christensen island to show fumaroles. These observations have been questioned but in the 1980’s the Nunataks were indeed confirmed as volcanic: evidence for very recent eruptions on Lindenberg and Dallman (but not Christensen) gave credence to Larsen’s observations. Murdoch island had an eruption around 1982 which spread ash around much of the surrounding ice. Based on the location and the date, the 1893 eruption of Lindenburg Island is an excellent candidate for Shackleton’s volcanic iceberg deposits. An interesting coincidence is that Larsen, like Shackleton, once lost his ship: in 1903 his ship was caught in the ice and sank, leaving him marooned on Paulet island for the winter. Larsen eventually managed to lead all but one of his stranded crew to safety. Paulet is a volcanic island on the Antarctic Peninsula, kept ice-free by geothermal activity; during his ice drift Shackleton came within 100 kilometer of Paulet island and tried to march there, but gave up when pulling the boats across the ice proved too difficult. Shackleton also considered sailing for Deception Island for rescue. In Antarctica, all stories are connected. Deception Island is less likely due to its distance from the ice shelfs and the lack of a reported eruption of the right age. 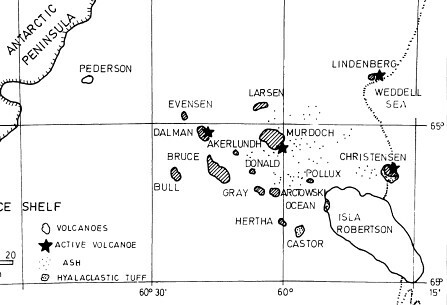 The most plausible origin of the volcanic stains seen by Shackleton is the December 1893 eruption of Lindenberg Island, with the iceberg originating from the Larsen A or B ice shelf. This could also explain the basaltic ash which could not have traveled far from the eruption site. The deposits stayed in the ice shelf for 20 years before calving in the southern summer of 1914. 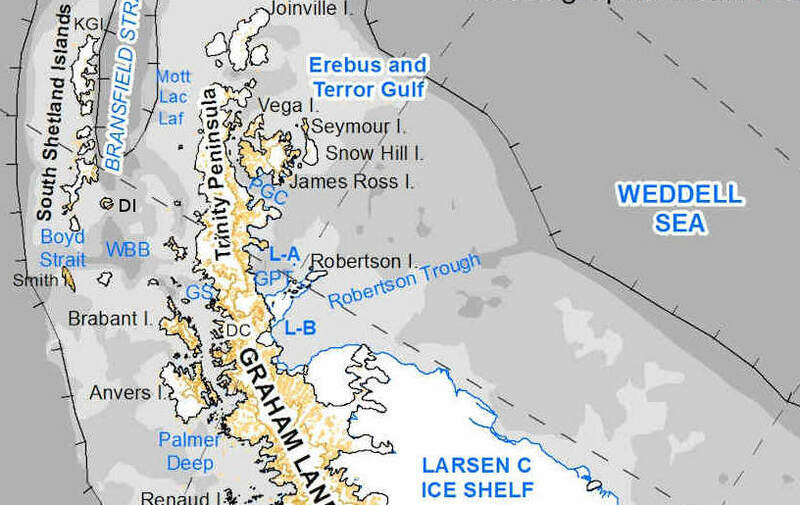 The Larsen B shelf, before its collapse, was measured by J. Wuite to move at 1-1.5 meter per day near the Seal Nunataks, or about 0.5 km per year. Larsen A may have been similar or a bit faster. Lindenberg Island was no more than 20 kilometer from the edge of the Larsen A shelf. Westerly winds would have spread the deposits from the volcano towards the edge of the shelf: the volcanic deposits would been released into the Weddell Sea over a period of some 40 years. A 20 year ‘shelf life’ is therefore reasonable. Calving in early 1914 started the icebergs with their volcanic legacy on their journey through the Weddell Sea gyre. They failed to escape the gyre, and encountered Shackleton a year later, part of the dense ice which soon after stranded the ill-fated expedition. 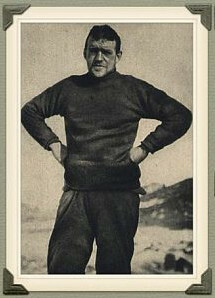 Shackleton died in 1922 of heart failure, on his fourth journey to Antarctica. He left us with inspiring stories, and many valuable observations. And now, perhaps, a second volcano can be added to his legacy. less, through the long withering night. rose in a sea of gold. There seems to be a collective shyness about breaking the ice (nudge-nudge) whenever a new post is up? Be that as it may! Thank you Albert for this wonderful post, deceptively simple in appearance only because of your sublime management of prose which disguises the fact that this post probably took quite a lot of research to arrive at. I loved it! I love learning something new and writing a post is a good way to learn.. I would be very interested if anyone has a different suggestion for a possible volcano in that region! But after thinking about all this cold, next time I may try a tropical volcano. Mauna Loa, Kilimanjaro, Mount Kenya, or such..
Well, if yer taking requests, the Tuscaloosa sea-mount has always been my fav. That would fall under flank collapse. The story of Shackelton is one of the greatest sea stories of all time. Thanks, enjoyed all of it…. I am fortunate enough to live about 10 minutes drive from the ship of Shackleton’s contemporary Robert Falcon Scott. The RRS discovery forms the centrepiece (for the moment) of my home towns waterfront and I’ve visited the ship many times. The whole story of Shackleton and Scott, and the explorations of the south Pole have fascinated our local school children for years. The ship itself is probably the largest tourist attraction in the city for the moment, (at least until the V&A museum opens in 2017.) and draws thousands of visitors to this quiet corner of Scotland. If I and wife manage to get to Scotland- Dundee is on our list. a bit odd about the way the mast and sails are arranged. Amazing she had a long life…. dock….Beautiful wooden boat, but in a tack in a good wind…. If I get a chance on Monday or Tuesday, I’ll head down and take some pictures. The researchers studied roughly 50 fossilized scrape marks left in 100 million-year-old sandstone in western Colorado. The markings appeared in irregular clusters resembling the display arenas some birds gather in when competing for mates. Researchers compared the fossils to patterns made by puffins and ostriches and concluded that they were not the result of nesting or digging for water or food. Instead, they say, the five- and six-foot patterns of scratch marks more closely resemble those left behind by courting birds. Today is the anniversary of the first episode of ‘Yes Prime Minister’. “Leading Questions” Quite appropriate and very demonstrative of the idiocy of believing most poll results. It really boils down to who commissioned the poll and what they want it to say. Fabulous article Albert! Thank you! I have been in the fortunate position to have visited Deception Island in 2012 visiting the Antarctic Peninsula on a tall ship (Bark Europa). We only made a landing at the ruins of the old whaling station but with a fresh thin layer of snow on the black lava beaches in the dying sunlight (and with a howling freezing wind). Here is a video of it, the first 4 minutes is the approach more or less. And here is a link to my journal of that time, at the bottom are links where you can find pictures of it, browse through it if you like it, you can freely download them. Thank you Albert for this fascinating post and thank you Virtual for sharing this beautiful video that puts us right there! Albert, I’m sure I’m not alone in feeling fortunate that you enjoy researching, writing and sharing. Thank you. Great story. Even though it’s cold, a wider overview of Antarctic volcanism could be cool too… For example, how many vulcanoes, if any, exist on the main land (i.e. East Antarctica) or is it as dead as e.g. Australia? By the way, I think that in the penultimate paragraph, calving is meant to have started the bergs off in 1914 rather than 2014? Thank you for the kind words. Antarctica is quite active volcanologically, not at all like Australia. But we don’t know well what is hiding beneath the ice: the known volcanoes are around the edges. Yes, that would make a nice article. I fixed the wrong date: thanks for pointing this out. And the CNN article that sprouted the FlightAware article. Thanks Albert I enjoyed the article. I love it when history is brought into the stories & of course, anything volcanic. Lately it seems I’m continually catching up with these posts. Always something going on. My youngest daughter, along with her college group flew to the UK on the January 5. Besides classes they are traveling in parts of England, Scotland and Ireland. She’ll be gone until the end of the month. She left for Sunderland University when we last communicated. Can anyone tell me what the weather forecast is for there? A good site to check the forecast is http://www.bbc.co.uk/weather/ They have a fairly detailed forecast, so if you give the name of a city it does return the forecast for that location, rather than for e.g. London as some sites do. This week should be dry-ish and for UK standards, cool. Or if you want something more ‘technical’, the met office website is my ‘go to’ weather station of choice. At the mo it’s breezy, showery and cool (5C), and it’s going to get colder with a fair likelihood of snow over the next few days. Thanks so much for your help. Even though it’s her 3rd year, she’s still my baby. 🙂 We had rain here yesterday then it turned to snow last night. We tried earlier to leave & it’s ice under the snow. The wind was causing a white out too. It’s still windy but you can see now. It’s currently 19F/-7C here. Tonight’s low is suppose to get down to 9F/-13C. What does “high frequency spikes ” suggest? This time of year that is quite common and indicates icequakes. Strange! At the moment it seems like the manually verified quakes somehow disappeared. The one at 05:18:27 now shows as M1.3 and 90% quality. Star also disappeared from the map. Never mind, it’s back now. But depth changed to 0.1km… Does this mean it was manually checked a second time, or did someone make a mistake? A small change was made. Remember it is Sunday and there will not be a full compliment of staff around. The first assignment may have been made by someone who wasn’t the specialist, or who also had other things to do. Remarkably shallow though. Most likely it was a case of blocking of the caldera floor. It is to be expected after a large eruption. Changed again. Now it is listed as M2.3, still at 0.1km depth and 99% quality. Star disappeared from map. This tern applies to the need for a species to evolve as fast as possible in order to keep up with its genetic enemy. In this case, diseases. Inter breeding with Neanderthal may have provided a leap ahead for hominids in combating disease and illness. Diseases normally come for germs jumping species. So if the immunity came from the neanderthals, perhaps the diseases also came from them.. Many modern diseases come from domestic animals: chicken, sheep, etc. But by lack of such animals 20,000 years ago (except perhaps the cat which must have domesticated humans very early), intimate contact with humanoid species may have been the most likely way to get new diseases. Nice that the same contact also brought the immunity, albeit only to the next generation! Apologies for the crudeness… but evidently, Ötzi may have had the screaming [redacted] → dysentery. I wasn’t there, but I suppose that having something like that would have made fleeing a bit difficult, and probably lead to his murderers being able to track, catch and kill him with ease. David Bowie has left us alone with his music. Feels like I lost a part of my childhood today. A song I listened to often to survive the time I was away from my wife. One of his newer songs. And watching Darkstar got just downright spooky. This song ALWAYS got under my skin. Every time it played at a party, I seemed to wind up in trouble with my girlfriend. It didn’t matter what the specifics were, if Suffragette city plays, give it up on reconciling any differences. I echo your &Carl’s comments. When I was at Uni he was an ever present influence & I’ve loved his music ever since. I have just come to the conclusion that reading scientific papers about large volcanic systems is sleep prohibitive, especially if you combine with seismic data that proves that there has been a magmatic intrusion ongoing under your wife’s house for the last 20 years. Seems like there is a ring fault volcano in the making right under the bedroom. I see that the movie the Martian received an award for best comedy. I hadn’t realized it was meant to be a comedy. Well, it did make me laugh uncontrollably at the idea of the tarp. Probably the best delivery of that line that could have been made. Well, I already dumped my stock in a company that had reconfigured goats to produce human insulin in the milk. I gad bought it so that I could realistically state “I own goats”. It was a dog of a stock that was quite good at loosing valuation, so I dumped it and took the loss on taxes. The scary part is not even listed: it helps viruses cross the species barrier. Swine flu comes to mind as a warning. Are we on the path outlined by Magaret Atwood in her Oryx and Crake triology? The shocking part about these chimeras is the use of abortion parts. Do the women who have terminated a pregnancy get asked if they would like to make an animal hybrid instead? It is their DNA so surely their consent should be necessary? Dante would be hard pressed to describe where I think those practitioners will wind up. I suspect much scarier stuff is being carried out in great secrecy and never publicised eg viruses targeted to infect specific human races…..
Wouldn’t it be fair to say that they are being tailored not to attack a certain race but every other? Or rather, that it is the directive given by the political masters who have ordered the research. Don’t think so. Genetic diversity within each human race is much larger than any difference between races. I don’t see how you can make a virus target only one race. it would laugh at you. Quite correct, Albert. The variation between races is less than that within, pretty much. The thing about genomic weapons is that its not the west you want to worry about, where there are controls but third world countries with pretty well the same capability, but no controls. Its like the phone bugging saga, the press went doallilally on the US or UK bugging merkel’s phone but none of them had the brains to realise that the russians, chinese and probably local crime syndicates can almost certainly do it too. The latter are a very much bigger worry. Targeting every other race with one hit would be tricky. But taking one geographical race at a time and sequencing the entire genome of 10,000s individuals ( feasible now) may well reveal sequences that are race-specific. Probably not in the genes per se (see Albert’s diversity comment) but in the control elements comprising ‘junk DNA’. Vast areas in there have not yat have function ascribed. There are also environmental impacts on DNA that persist a generation or two and may have a geographic bias. This is ‘DNA imprinting’ – methylation is the best known. So I dont doubt there are race-specific targets to be discovered. Whether any western lab is researching the possibilties I dont know. But such research is dirt cheap compared with conventional warfare that I dont doubt it has been started somewhere. I doubt we in the west are doing it. But I do hope that quietly behind closed doors the potential of targeted gene warfare is being kept under surveillance. Is the idea that the junk DNA mutates faster, and therefore can have diversified? As far as ‘human races’ has much meaning, African populations are ancient and have so much diversity I cannot see that a targeted approach would work. The other ‘races’ are really very similar. The american indians would have separated 15-20,000 years ago. Eurasians populations have had major mixture events regularly over the past 12,000 years, so would any DNA sequence become present in the entire population? Australian aboriginee populations are older but has not been isolated for the past 200 years. It is a difficult balance, changes that happen slow enough that a population becomes uniform, but fast enough that it differs between populations. I can’t see enough for such an approach to work. But you have more expertise in this than I do. ‘Junk’ DNA is a serious misnomer, and its only recently that its function in control the genes proper is being explored. And there’s lots of it to explore. There are for instance anatomical differences between races that cannot be ascribed to adult gene exppression (or mutations) but probably result form control elements in the ‘junk’ being active at different stages of development. It is in the junk and its involvment in development that race differences in many functions will I suspect be found. And the targets. The diversity amongst modern humans also embraces interbreeding in some regions not others with Neanderthals ( west eurasia) and Denisovans ( in the east) and maybe other extinct human species. I’m far from expert, but am concerned at the power of mass whole-genome DNA sequencing and its potential for abuse. It is fine using genetic polymorphism to optimis a drug regiem for patients ,but the potential downside does need airing. … and my greatest concern is creeping featurism. That’s where “useful” purposes come about because the database happens to already exist. That’s how fingerprints came to be used in crime cases. Ostensibly, you shouldn’t be concidered a suspect unless there is evidence pointing towards you. Yet wholesale sweeps of fingerprint databases occur on a pretty alarming basis. Should you be concidered a suspect for a crime that happened thousands of kilometers from you? If your prints are looked at in a wholesale sweep, you are in fact, a suspect. Started as a way to identify mortal remains in war casualties, law enforcement salivated at getting their hands on the technology. What do you think is gonna happen when a population wide database exists? How about when insurance companys learn that they can predict the tendency for some rare disease and modify their actuarial tables to charge you a substantially higher rate because your genetic makeup points at you having an elevated chance of getting that disease or just denies you coverage? For the sake of argument; Assume that your particular genome shows that you have a low tolerance for alcohol. Should your coverage be denied if operatives for your insurance carrier find out that you had a glass of wine over christmas? Insurers will know that roughly half Asians lack mitochondrial aldehyde dehydrogenase so alcohol metabolism lingers at acetaldehyde, which is toxic. Adducts formed by acetaldehyde have been implicated in cancers. The thin-fat phenotype is another recognised risk factor in asians. Whether insurers penalise I dont know. When the $100 genome arrives then health/life insurance will become impossible for those unfortunate enough to have drawn short straws. Insurance is always a tricky issue. It only works if there are enough people grouped together, and it only works if neither side holds secret knowledge. If your DNA is known, both sides in the bargain need access. For insurance, it is better if it is not known, but for the hospital, they should know it. In such a complex situation, there is a role for government regulations. For instance, it could rule that discrimination by genome is not allowed, i.e., can’t be used in calculating premiums. Some countries have a minimum health insurance level which companies have to provide against a common cost level. I could also mention age discrimination: it is illegal in the UK except for insurance purposes. That seems a problematic exemption. Dunno, the sneezing pig story gave me the willies. More quakes near Hekla this morning. Early signs of unrest? The drumplots look busy too. The first half of yesterday has cycled off now but to my untrained eyes I thought I saw something akin to tremoring – sorry, no screenshot. A bit unusual, but nothing that has not happened before. Here is what I look for, I prefer to have several or all of the signs before I get excite. 1. Uplift, Hekla does not necessarily uplift in the usual sense prior to eruption, but there would be changes horizontally. 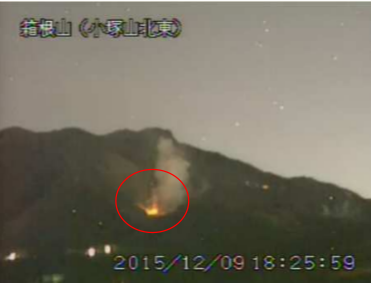 Could indicate opening stage of the fissure opening. 2. Borehole strainmeters would change rapidly, and a lot of change would be seen. Indicates opening stage of the fissure. 3. Earthquakes above M2. Was the starting signal of the last eruption. 4. An earthquake swarm that is highly centered at around 2km and upwards. Starting signal of the last known eruptions. So far the earthquakes are a bit to deep and far apart, and they are not accompanied by the rest. The quakes seem to be along the direction of the fault (rift) (SW-NE) running through Hekla. Worth keeping an eye on but in itself not a worry. Hekla tends to give little warning, so if nothing happens very quickly after such a quake, it is probably just a quake. Admins – there’s a problem with the RSS feed for the comments on this site due to the special character value of the accented e.
“This feed contains code errors. Reference to undefined entity ‘eacute’. Thanks Gaz, Ill take a look. Ive edited the site title to remove the accented “é”, I dont use the RSS so you’ll need to check if its ok.
I’ve been working a lot with RSS feeds recently for digital signage displays where I work, one of the joys of being a webmaster… although not the entire web as the kids seem to think! I think this is because current internet standards are not dealing so well or in the same manner with accented characters. If I’m right, they still cannot be used in domain names. If used in page titles, it depends on the ISO standard which is used; if that is not translated correctly when using accented characters, you get compatibility problems, or bugs… I think it is rather something the developers at WP should have a look at. Looks like there might be a small spike on the ‘Dyn’ and ‘Von’ low frequency tremor plot. Definitely looks weather-related. That’s not really how you would see tremor occurring. … great. I have to spend my first cup of coffee explaining Yellowstone. Small steps. There are certain concepts that are lacking with my target audience. If I go too fast it will just heighten the feeling of doom. BTW, there are 1 in 115300 odds of being injured in a pogo stick mishap. Remember that 1:4 500 000 die daily due to sock related accidents. Who would imagine that putting on your socks is dangerous. The most common sock related death happens while putting them on while standing. I guess they fall down stairs and stuff. Speaking of socks and stairs… I nearly bought it while wearing socks at the top of the stairs at my “apartment” in base housing in jersey. My wife called the dog to go outside and I was in the way. Thanks to my cat like reflexes, I managed to faceplant before I went down the stairs. Sometimes it’s not that you fall, it’s where you fall thats important. Wood floors and socks do not mix well. BTW, that same dog managed to injure himself when he went tear #$@ing into the house. He found that wood floors are just as tractionless to paws as they are to socks…. he didn’t make the expected turn and slid headlong into the bookshelf after darting in from outside. Ours have a tendency to drop their wallet or to use the back of their water bill to make out the robbery note. Let’s just say that they usually are not that bright. Good stuff Albert. Happy New Year everybody. And welcome back to the prodigal father. Seems to be a nice quakestack in the middle of a sub aquatic volcano that is beleived to be a part of the Theistareykjarbunga volcanic system. Aside from Hekla and Mars, to name but a few places, I noticed that the northern town of Siglufjordur’s drum plot has been quietly showing some interesting readings the last few days. It has just quietened down but there is still a little to see. Interestingly today in the Independent newspaper there is an article about Shackleton suggesting he had a hole in his heart that he would not admit to anyone. It might be relevant to his fearlessness in the face of danger and his willingness to live life at the very edge of knowable experience. His achievements were incredible. I think it was known that he had some health problem, although his doctor later attributed this to his drinking. Scott did send him home because of health concerns, but it can’t have been too severe or he could have not made the trip to and across South Georgia. The hardship during the Endurance expedition did affect him: it seemed to me he looked very aged in photos taken after his return. A hole in the heart is not uncommon, I think. Something is brewing on the horizon. The giant is inflating. Any eruption is though at least a year away. Something’s brewing alright. Though, judging from the cumulative seismic moment in the area, it seems to be building slower than before the previous two eruptions. Then again, with rifting going on, things might change quickly. And yet another Indonesian Volcano is rumbling into life. This time it is Gunung Egon in Indonesia that is active. Currently it is suffering from volcanic earthquakes both shallow and deep well above the baseline. Gunung Egon had been long dormant before it started to suffer explosive, probably phreatic to phreatomagmatic, detonations between 2004 and 2008. Before onset of activity it had been highly active with fumaroles and boiling lava lakes. I think this one is worth taking a deeper look at. The volcanoes on the far eastern side of the Indonesian arc (any volcano on or east of Flores island) are a bit unique in that the Australian continental plate is being subducted beneath them as opposed to simply having the oceanic crust subduct beneath the Sunda trench. This makes the magma compositionally unique to other Sunda arc volcanoes, although I don’t know if it’s anything particularly noteworthy. Bit concerned it could go big..
Well, the timing is right, mankind is basically fully stupid now and could use a serious wake-up call. A star appeared on the maps. The depth implies blocking of the caldera floor as the plug resettles after the eruption. I take your point, but I don’t understand why the blocking would be occurring 6-9 months after the eruption finished rather than in the period immediately after – when earthquake activity diminished to a lower level than we’ve been seeing of late? Blocking is a gradual process that can take time. In mining that process can run in fits and spurts for decades until you get whopping big holes in the ground. … so “blocking” is a collapse structure formation in process? Blocking is actually a mining term, it is when the roof over a mine starts to collapse in “blocks” until it reaches the surface. Like in the Captain’s Pit on the picture I posted. The quakes don’t actually come from the caldera. they are located on the ring fault, just around (but not inside) the main locations where the earthquakes happened during the collapse of the caldera a year ago. If I got my numbers correct, than the size of the quakes scales reasonably with the recently reported inflation rate. The inflation is something like 10cm per year, and the deflation was 100 meter per year, which is a factor of 1000 different. The maximum size of the current quakes is around 3.2, and last year was around 5.2, which is a factor of 1000 different in energy. So I am not sure it is blocking. Problem is just that I can’t find the inflation on the GPS-plots. At least not on that scale. Also, I can’t find any deep earthquakes pointing towards fresh magma entering the system. At best I can find medium depth earthquakes from deep magma sloshing about. There could of course be MOHO-melt that goes up quietly through the root-feeder. And the melt happening due to underpressurization. But in the end, however you look at it you would need a lot of new magma to repressurize the magma reservoir to the point where you get a new breaching of the reservoir. I haven’t seen the inflation data either. It was reported to be undergoing re-inflation. There has only been one significant deep quake. The rest are shallow. Do you know who reported the inflation? I find it a bit odd that I can’t substantiate it with the GPS data that is publicly available. DYNC is inconclusive with no up-component. N/S has shifted trajectory, but no shift on E/W. GFUM though is firmly inflating. 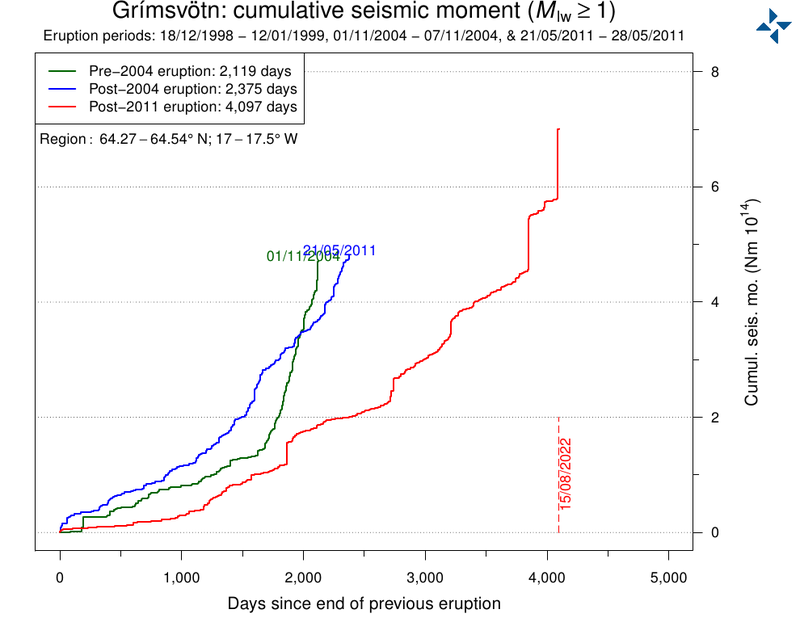 Only problem is that it is Grimsvötn that has inflated 10cm in a year. And that is expected. HOFN and JOKU are also supporting rapid intrusion into Grimsvötn. So, no data at all that Bárdarbunga is inflating. It is Grimsvötn that is doing its predicted thing. Here is the source of the statement inflation, 19 november ’15. No wonder that trajectory calculation was bungled. It did not use GFUM (Grimsvötn) data. If you omit that and use only those GPS-stations it does indeed look like you have 10mm of uplift. But if you add GFUM and HÖFN you get a 10cm inflation of Grimsvötn instead. Bias through selective picking of data. Is it me or does it look like there were two quakes? Was that a long period event a few hours later? Significant? Thats probably 6.7 quake at Hokkaido Japan. This is really worth reading for the spectacular images. Even if Enceladus is shown upside-down. And in other news, there has been another quake in the series of very deep earthquakes underneath the Andes, at 600 km depth. This one under Bolivia, in between the series under Brazil and the series under Argentina. It may still be stress from the very large quake in La Paz in 1994. the La Paz section is now quiet but this quakes occur in adjacent areas. Might just be someone playing with a Laser. I need to practise picture posting! A brief article about Bárdarbunga, Kverkfjöll and Grimsvötn!